We fight the impersonality of them when manipulated like a raw statistic, or when left scrambling to meet our quotas, or being scored on performance, or reduced like a prisoner of war to simply a name, a rank, and a serial number. Increasingly, we fall dependent upon them and adjust to their wishes. In impossibly long invisible strings they are etched into the gray matter of our digital alter egos. And more than they can ever know, our fate rests on their keyboard. But take heart people–these noiseless, virus-prone brainchildren of the Information Age cannot even wipe their own noses, change a light bulb, or count to three! They are built merely of brittle, geek-spawned, non-metalic chips of sand. Though they can perform seemingly infinite calculations in a matter of moments, they cannot think for themselves and possess less real intelligence than the Guatemalan banana slug. But unlike the slug, when squashed beneath your boot, all that oozes is their mindless, meaningless number circuits. Modern digits depersonalize and reduce; they are the new minions of the postmodern world. To our government, they tabulate us by our driver’s license, zip code, age, date of birth, Tax I.D., and Social Security; to our friends, they see that we are contacted and catalogued by our street, phone, fax, and cell. To ourselves, they orient us to the world by our clock, calendar, thermostat, speed limit, paycheck, credit card, and bankbook. They put us in our place, structure and monitor our lives, and stifle our (sometimes preferred) irrationality. For that we regard them as useful poison. They make put us in order, but in the end they will kill us. Tempting though it may be, blaming the guileless digit is an exercise in misplaced rancor. They are only doing their job. In fairness, number digits are merely functionaries, practical organizers of things that come in larger quantities than we have fingers to count upon—and shown the proper respect, they may be admired as the “meta-fingers” of extended reality. Sure they can hypnotize with their endless continuity, minisculity, and grandeur, not to mention their impeccable consistency and accuracy in operations. And yes they can fragment and fractionalize any quantity, thereby reducing the very complicated to the very basic. The lowest common denominator, however, is that they work for us, but they don’t make us happy. In essence, “quants” are merely “bean counters,” that is, signs of quantification hobbled to the datum of life. In themselves they are empty and meaningless beyond the defined parameters, base-sets, and applications that WE assign them. They are the unpaid accountants of size and quantity who work on the weekends, and we human beings in the final reckoning are their lords and masters. (Though if truth be told, not for very much longer thanks to those traitorous AI wizards bent on giving them real brains. A really bad idea when you think of it). Luckily, in their current generational state they are too stupid to plan ahead for their own future. Innocent or not, we defer to them far too often, particularly when making choices concerning where to park ourselves in our worlds. Based on the laws of large numbers, in shockingly enormous numbers, we today elect to find our answers in THEM, and not in ourselves. Scientific polls, surveys, focus groups, actuaries, demographics and statistics implore us more than ever to place the cart of probability before the horse of possibility—and in so doing, decisions based on numbers only lower the bar for self-fulfilling prophecy. We become ever more predictable, ever less imaginative. Tacitly, we contribute to validating our own statistical probabilities. Decisions that are largely data-driven— “The numbers are in: Americans prefer Toyotas 2 to 1 over any other import!”—and as such, not only do they bring a lack of individuality and conviction to our choices, they remove human responsibility for their outcome. Popularity, much like in high school, rules the roost, and the virtues of “groupthink” are reinforced as numbers not individuals become the choice-makers. The hidden agenda behind data-driven America is to eliminate the non-rational from its equation. The non-rational, we must remember, includes not only the vast chaos, randomness, and spontaneity of the natural world, but in the human mind our vital processes of intuition, instinct, emotion, and imagination. Taken to the extreme, the digit-based society becomes a sort of rote, paint-by-the-numbers, preschool activity, eventually graduating an adult class of mo-rons (dry technicians unpracticed in creativity or wisdom). However, one must concede that a certain raw and elegant “signature of being” is revealed in the reduction of a thing to its essential name, rank, and number. Peel away the outer layers of any object’s sheathing until simply its most fundamental suchness remains, devoid of particulars, and behold what is meant by number quality! It is the essence of any object or being’s energy, purpose, pattern, and structure. The prideful numerologist may sneeringly demote what are mistakenly called “numbers” to their more vulgar and proper class of mere “figures” hoping by this distinction to erase any further misconception that mindless “arithmetic entities” be confused for his beloved and intelligent true numbers. And he is not wrong to do so. Behold the richness of character in the pure number two, for instance, or the splendor of the magnificent seven, or my own personal favorite the nine, with its magical properties of increase with simultaneous essence-retention, and you’ll surely understand why. 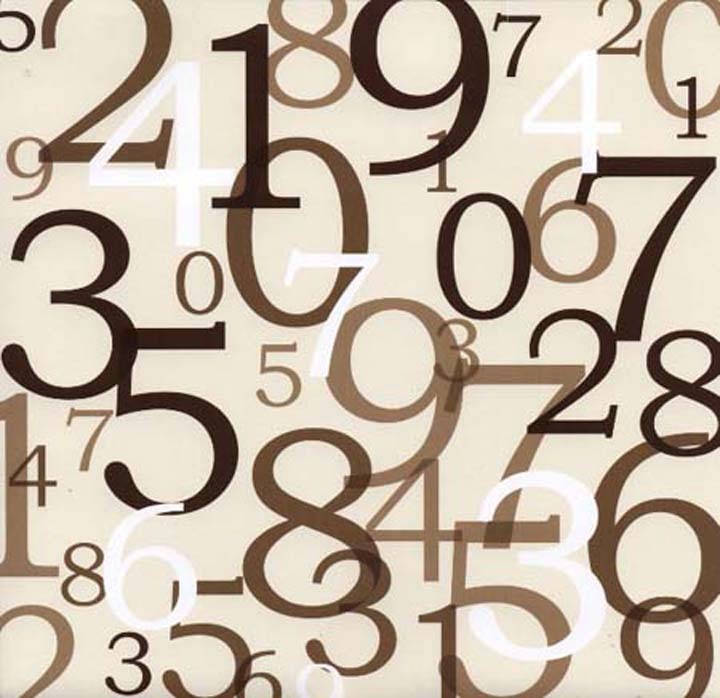 But one needn’t be a numerologist to appreciate the essential beauty of a number’s naked truth. Without metaphysical association, an object’s most primary quality, wrote Carl Jung, is whether it adheres to the “one” or the “many.” By fifteen months of age, adventuress toddlers first behold a profound sense of “the many” when stacking a tower of four rubber Barney blocks onto the living room carpet and delighting in the primitive magic of multiples (well before rational faculties will instantaneously override these animistic perceptions of the world). Thereafter numbers begin to amass a parallel and private soul of their own, one rich in poetic allusion and emotion like those found in the fabled three blind mice and the seven dwarfs of the pre-Oedipal years, where threes and sevens become indelibly merged with the narrative itself, marking more than a mere counting of myopic rodents or bearded little people. Some years later this more primitive vestige of number magic, and the numinosum it inspires, gathers a certain adolescent ambiguity which was held “once upon a time” transfixed to the ball-fields and backyard games of latency (though naturally, in watered down versions due to the cruel intrusion of social awareness and hormonal change). Yet today one worries whether boys and girls are not robbed of this mythic outlet in their epidemic electronic programming, so limited by its binary options, over-buttoned, and divorced as it is from the traditional number magic of childhood? Of course, there is always Play Station Three. Popular culture too plays upon the universality of living integers lost to the oppression of just numbers, as even feckless adults prefer the older system when describing the metaphors of lived experience, no matter that “A bird in the hand is worth two in the bush” “one” remains “ the loneliest number,” “two is company” and unquestionably “three’s a crowd.” The old system in fact, becomes the stuff of proverbs, love songs, lullabies, lucky numbers, and magic spells. But why count backwards in time? Because the old system better captures what we feel and intuit to be true before we’ve been conditioned to know better. It speaks the quasi-logical mathematics of who we really are, that is, when we give up pretending to be singularly rational quantities. There were once eleven generals who had to decide whether to attack or retreat in battle. They held a meeting and some were for attacking and others for retreat. They had a long strategic discussion, and finally took a vote: three were for attacking, and eight were for retreating, and they therefore decided to attack, because three is the number of unanimity! You see, in China three has the quality of unanimity, and by the chance effect that three people were for attacking they hit the quality of the number three, therefore that opinion was the right one. A Chinese might say perhaps that underneath, unconsciously, there was unanimity for attack, despite the fact that only three were consciously for it, while eight were only unconsciously for it and consciously for another decision. Therefore they attacked—and successfully, according to the story! This twist to our Western assumption of number quantity and “majority rule,” exemplifies the often paradoxical meaning-dimension that opens up when working with numbers qualitatively. The intuitive mind looks more for qualitative, feeling-toned relationships and anomalies, often oblivious to strictly quantitative factors. But the vignette also shows a magical aspect of numbers as well– magical in the sense of revealing information existing beneath the veil, or what in psychological usage we’d term today “the unconscious.” Number magic is common but not exclusive to divinatory practices, including the I Ching and Tarot, but it can be found as well simply in special properties that natural integers display in computations, that is, arithmetically. Natural numbers best capture the essentials of things regarded sacred, that is, when used symbolically and qualitatively (as opposed to literally and quantitatively). They provide the shorthand for human discovery of the depth dimension. At such times, they are universally recognized for pointing beyond themselves to the mythic world of the human soul.